Friday, May 6th: We didn't expect to be out until after midnight the night before. We set our alarm clock for 6 in the morning because we had breakfast reservations at the Hollywood & Vine restaurant in Hollywood Studios park where we were going to eat with the playhouse Disney characters at 8:05. At least we thought that we had set the alarm clock...﻿ When I woke up, it was 7!! There was NO way that we would make it... They say to allow 45 minutes just to get transported anywhere. So while I was frantically trying to get the girls and I ready, Kasey ran down to the front desk to see if we could push it back but ended up having to cancel our reservation. Over-sleeping... What an awesome way to start the day, huh?! So instead of eating with Disney characters, we slowed down a little, enjoyed some scenery outside our room, checked out the pool and ate at our resort food court. My little ladies and I... Love them! We got each of them a character mug and after we ate our Mickey Mouse waffle breakfast, we got in line to be taken to Hollywood Studios park. I'm so bummed that I can't show my photopass photos yet, because we have family pictures taken in front of the Hollywood Tower of Terror Hotel, and the huge Fantasia hat when you first walk in... But here are some highlights that I can share! The first thing we did when we got there was put in for our fast pass tickets for Hollywood Tower of Terror. Then we walked around taking in the scenery, then found the "Honey I Shrunk the Kids" Movie Set Adventure. It was like a huge playground, it was SO neat! I really enjoyed this part. The girls riding "Anty" (I think that's her name, I can't really remember) We rented the movie right before we came here so they would know what this was all about! They had a blast in here!! Isla's big sisters helping her climb a spider web. This was so fun, our whole family went in it the first time, and the girls wanted to do it again so I went with them that time while Kasey watched. The three of them on a leaf/flower? slide, Isla was being a scaredy cat so Mikenna helped her... Could have something to do with all the dark tunnels, sound effects, etc... But that slide looks pretty harmless. Ha! Huge tonka truck and a scrabble piece! How cool is this place?! One of my favorites for sure! We wandered around some more, and stopped in to watch the "Indiana Jones Epic Stunt Spectacular!" And it really was! Thoroughly entertaining, the girls watched in amazement the entire time. It made the hour wait (half in line, half in our seats) kind of worth it... kind of! Kasey got goosebumps when they sounded the theme song when it began! Haha :) Downside to having front row seats? Having to wait for EVERYONE else to file out of the too few exits... 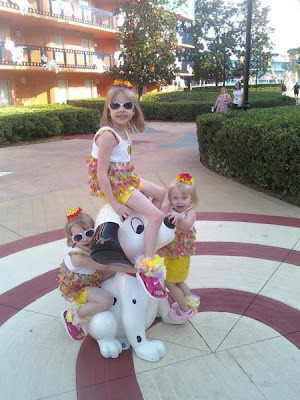 When we finally got out, we got the girlies an ice cream treat (Mikenna picked a long rainbow twisty popsicle, Adiee picked a Mickey Mouse shaped dilly bar, and Isla picked a Mickey Mouse ice cream sandwich) and Kasey and I shared a frozen banana covered in chocolate and nuts. Then, we got in line for the Studio Backlot Tour. Kasey distinctly remembered this when he went to Disneyland when he was little, so we had to make sure that we hit this. Well, we didn't have to wait in line long, but we just made it to be the very last on the tram and they took us around various movie effects... And the one part that he was most excited for was not that cool when you are in the back of the bus! haha ;) The train went up a "mountain" and it simulated some kind of disaster complete with a rocking bridge effect, exposions, etc... Isla didn't like it much at all, so she probably appreciated the fact that we weren't in the heart of the action, the rest of us felt pretty cheated. Afterwards, we walked around trying to find "Mama Melrose Ristorante Italiano" where we had lunch reservations at 2:25 pm - and we did NOT want to miss them too! 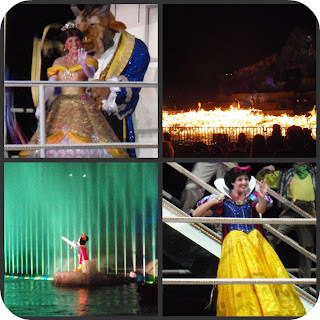 Haha :) Especially because they were our ticket into guaranteed seating for "Fantasmic" with our 'dinner package'. While we were waiting for them to seat us, we were all kind of bummin' the whole day so far seemed kind of blah. We had been in the park for 5 hours and we only did 3 things, and most of it was spent sitting, waiting, and walking... (Including the night before at the luau.) The girls were not that impressed with Disney World so far. And to boot, the times for the "Tower of Terror" fast passes were quickly approaching and we hadn't even ordered yet. It was already almost 5, the park closed at 9, still only did 3 things, and we ended up missing our pass times. What a bummer! But we weren't going to let our first day of our vacation be a flop, we found out that the would accept late passes so instantly, our day got better. We headed all the way across the park so that we could ride it. Thankfully they have this thing called Rider Swap, so that one of us could stay behind with Isla (basically the same thing as a fast pass) without having to wait in the hour long line. Anyway, Kasey took Mikenna while I waited in the gift shop where the ride ended with Adiee and Isla. Mikenna was ecstatic when she got off! She loved it and all of a sudden Disney World was the greatest place on earth! Haha :) So I took Adiee, and Mikenna again! Adiee was kind of scared, and when we were on the ride, she had what looked like a silent scream on her face the whole time! Hilarious! She said she liked it, she just didn't want to go on it again, but she was super brave! Before we left, they wanted to poke around the gift shop a little. Mikenna HAD to have this notebook that was $15, I've got to admit that I tried really hard to talk her out of it, but she wasn't going to budge!! Hey, if that's what she wants, that's what she wants... Adiee didn't see anything in this particular shop so I took her to another while Kasey took Mikenna on the ride one more time. Adiee wanted a keychain with Stitch on it, and Isla decided if Adiee was going to get one, she needed one too. The "Voyage of the Little Mermaid" was absolutely incredible! We had seats in the very front, next time we will definitely shoot for the middle and a few rows back because we couldn't hardly see some of the smaller stuff over the rock stage. The girls were enthralled with it from start to finish, and LOVED the bubbles they dropped over the audience. Of course they have to put a gift shop upon every attraction exit, so again we had look. They were bound and determined to spend every last dollar they had the very first day even though Kasey and I tried to talk some sense into them. Isla picked out these sleeping beauty jammies, Adiee bought a Tangled figurine set, and Mikenna picked an Ariel purse. We ventured into Pixar Studios but the wait times were ridiculous. "Journey into Narnia: Prince Caspian" was right there and it was only a 20 minute wait so we decided to go ahead and do it. Biggest. Waste. Of. Time. EVER. We waited in line to basically watch an extra long movie trailer, it was disappointing to say the least. We were pretty sick of sitting down and watching show after show, so we were looking for something to ride and so we got in line for "The Great Movie Ride" This picture was taken while we were in line, SO cute!! It was a gentle ride that took us through each movie era, and of course there were some parts that scared Isla so it was yet another ride she cried a little on... What a wuss!! Haha (That was a joke, she's just a baby! lol) I was able to console her pretty good. 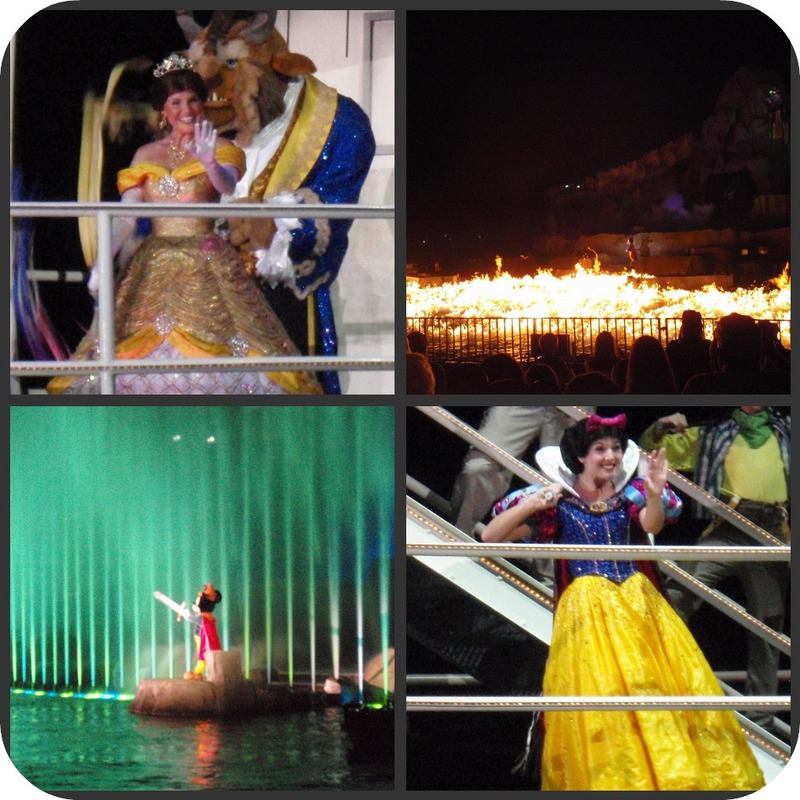 We were headed to the Fantasmic! show, and I needed to get a picture of them in front of this sign. When we were at lunch, our waiter said that they opened seating for this show 90 minutes prior, and that it seated 9,000 people in the stadium and on average turned down 5,000 people at the gate! Well, we did NOT want to wait for an hour and a half to watch this show so we decided that we would go a half hour before (the latest they were going to let people in) since we had guaranteed seats. It worked out perfectly, we got great seats and didn't have to wait for-ever to get them! The one regret I have, was that I really wanted to see Beauty and the Beast, Live! But there just wasn't enough time in the day with all that waiting we did. Next time though! :) And you know how I told you that we had to wait in line at our bus stop for almost 2 hours the night before?? Not this night, we are quick learners haha!! We booked it out of there before the rest of the crowd, got our stroller out of the stroller parking lot (haha) and sprint/ran/power walked all the way from the far right of the park, to the park exit, and then to the transportation area. We were one of the very first in line! I couldn't believe it! We were at the hotel by 10:30pm and we ordered pizza to be delivered to our room but the girls fell asleep before it even got there and Kasey and I weren't even really that hungry. So we ate a slice in bed, set the alarm clock (for real this time), and went to sleep.